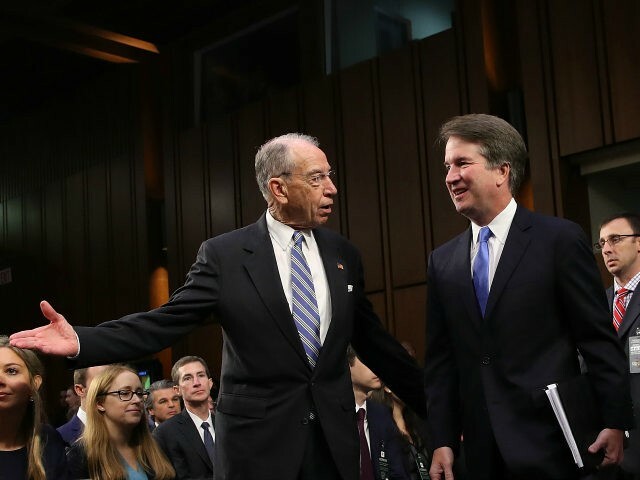 WASHINGTON, DC – Sen. Chuck Grassley’s (R-IA) opening exchange with Judge Brett Kavanaugh on Wednesday covered judicial independence, wartime powers, the importance of precedent, and federalism, previewing issues that would arise repeatedly over the next two days of questioning with the members of the Senate Judiciary Committee as they consider his fitness for the Supreme Court. “What makes a judge a good one, and what influences in your life have shaped your vision of how a judge should go about doing his job?” Grassley began. The judge went on to cite several famous cases where the Supreme Court showed the courage to do what the Constitution required, against popular pressure. He discussed Brown v. Board of Education, where the Court struck down racially segregated schools; Youngstown, where the Court struck down President Harry Truman’s seizing control of steel mills during wartime; and United States v. Nixon, where the Supreme Court ruled that the Constitution does not shield a president from turning over audiotape evidence when subpoenaed in a criminal investigation. “No one is above the law in our constitutional system,” Kavanaugh answered, citing The Federalist No. 69, where Alexander Hamilton explained ways that the U.S. president is different from a king. “Under our system of government, the executive branch is subject to the law, subject to the court system,” Kavanaugh said. Asked for an example of his voting against the president who appointed him to the judgeship he currently holds, Kavanaugh cited the Hamdan decision. He’s prosecuted before a military commission — signature prosecution of the Bush administration. Comes to the D.C. Circuit. I’m on the panel. I write the opinion, saying that his military commission prosecution is unconstitutional. [It violates] ex post facto principles. You’ll never have a nominee who has ruled for a more unpopular defendant than ruling for Salim Hamdan. Why did I rule for someone who had been involved in September 11? Because the law compelled it, as Justice Kennedy showed us in the Texas v. Johnson case. “If you walk into my courtroom, and you have the better legal arguments, you will win,” he concluded. “Were you asked about your views on Roe v. Wade?” the chairman asked as a follow-up. “No,” the judge answered again. The 10th Amendment reinforces the structure of federalism that’s in our constitutional system. It’s important to remember the role of our states in our constitutional systems, and it’s important to recognize as individual citizens — something we often forget, particularly in a process like this. Our rights and liberties are protected by the federal Constitution, and by the federal courts. But they’re also protected by state constitutions and state courts. Without discussing whether specific precedents were correctly decided, Grassley asked Kavanaugh to unpack his view of what force those precedents have in future cases. Precedent also reinforces the impartiality and independence of the judiciary. The people need to know in this country that the judges are independent, and we’re not making decisions based on policy views. Part of that is to understand we’re following a system of precedent … the court, every time someone [new] gets on [the Court], it’s not just bouncing around to do what think is best. It’s what’s the precedent of the Supreme Court is always part of the analysis, an important part. For 12 years, I’ve been applying precedent of the Supreme Court and of my court. Every day for 12 years, I haven’t been getting up saying, “How can I rewrite the law?” I’ve been getting up for 12 years every day, saying, “Okay, how can I apply this Fourth Amendment precedent to this fact pattern that comes before me?” So precedent is the foundation of our system. It’s part of the stability. It’s ensuring predictability. And it’s just foundational to the Constitution, as Article III [of the Constitution] and Federalist 78 made clear. Grassley closed by reminding Kavanaugh to abide by the Ginsburg Rule — named after Justice Ruth Bader Ginsburg, who famously told the Senate that judicial nominees should give “no hint, no forecasts, no previews” of how he or she would decide any future case because that would deprive the parties, in that case, their right to an impartial and open-minded judge. Announcing any such future vote as a judge “would display disdain to the entire judicial process,” Grassley concluded, quoting Ginsburg. Kavanaugh responded that he agreed with Justice Ginsburg.